I've enjoyed collecting United States Mint uncirculated coin sets since the 1990s. Uncirculated sets, often referred to as mint sets, are collectible sets of coins packaged by officials at the United States Mint. What comes in a mint set, and why are they so enjoyable to collect? A mint set is a set of coins from a given year that generally contains one example of each circulating coin issued by the U.S. Mint. While all mint sets packaged since 1959 contain just one specimen of each circulating coin, as described above, earlier mint sets were assembled with two coins from each denomination and mint. These early mint sets, made from 1947 through 1958, are therefore often referred to by hobbyists as double mint sets. Mint sets are fun to collect. I first got into collecting mint sets back in the early 1990s, and the market has changed significantly since then. While the United States Mint was regularly producing more than one million mint sets each year back then and had a steady stream of collectors who eagerly wanted them, the number of mint set collectors – and, subsequently, uncirculated coin set mintages – has fallen off in recent years. Today, an average of less than 400,000 mint sets is produced each year at the U.S. Mint. That number continues falling as more and more coin collectors seem to focus on buying other types of Mint products, including bullion coins and commemorative coins. Mint set prices are, in some cases, at multi-year lows as fewer collectors seem interested in buying these once-popular coin sets. So, what are the best bargains out there today? Early mint sets from 1947 through 1958 were originally housed in cardboard panels. Today, relatively few of those sets survive in their original government packaging. Values for these early sets range from about $350 up to $2,000 or more, with the earliest of those sets trending into the four-figure mark. Collectors can expect to pay premiums for sets containing exceptionally nice coins. Look for sets containing wholly original packaging and well-struck, rainbow-toned coins for the best return on your investment. Mint sets made between 1959 and 2006 are packaged in cellophane envelopes, and all sets made from 1959 through 1970 contain at least one silver coin. The 1959 through 1964 sets include two examples each of the 90% silver Roosevelt dime, 90% silver Washington quarter, and 90% silver Franklin half dollar or 90% silver Kennedy half dollar. The mint sets made from 1959 through 1964 generally sell for $35 and up, though you can find bargains here, too. 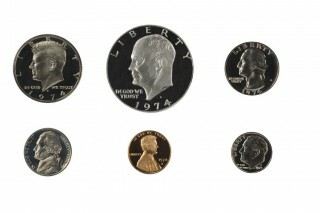 From 1965 through 1967, the U.S. Mint made special mint sets containing one proof-like example each of the Lincoln cent, Jefferson nickel, clad Roosevelt dime, clad Washington quarter, and 40% silver Kennedy half dollar. These sets generally sell for around $10 each – sometimes significantly less if the dealer is trying to clear our inventory. The U.S. Mint resumed regular mint set production in 1968, and the mint sets made since that period are relatively plentiful and affordable. Among the few exceptions include the 1970 mint set ($15-20), 1776-1976 40% silver 3-piece Bicentennial set ($15-20), 2008 mint set ($30), and 2012 mint set ($60). Otherwise, most of the other mint sets made since 1968 sell for less than $10 each. Some of these sets sell for less than $2 over face value. Think it's hard to find 1982 mint sets or 1983 mint sets? You won't find any official, government-issued sets. That's because the Mint made none due to federal budget cuts at the time. The only official business-strike coin sets the Mint in 1982 and 1983 were souvenir sets, which were sold only at the Philadelphia and Denver Mint gift shops. Each of those sets was made in small numbers of between 10,000 and 20,000 and are worth $50 to $65 each. The Philadelphia and Denver 1982 and 1983 are often bought by mint set enthusiasts and are scarcer than many people believe. Prices for these sets have increased in recent years as more people realize just how rare these sets – and the uncirculated 1982 and 1983 coins within – really are.